Lamb is by far my favorite type of red meat. I think many of you know this, considering how many people tell me they always think of me when they eat lamb. Nothing hits the spot more than a rich piece of high-quality, grass-fed lamb! 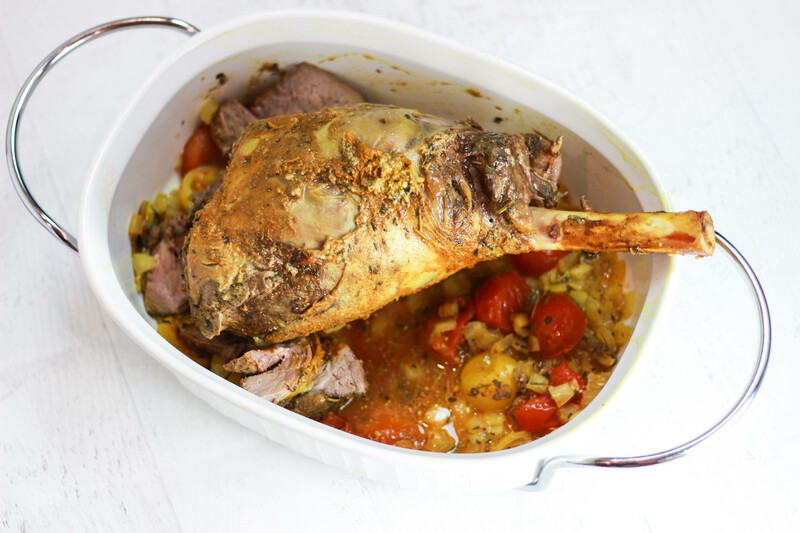 I’ll take any cut, but when I’m cooking in bulk or for a larger group and I have time to let the meat cook for a few hours, my go-to choice is a big leg of lamb! 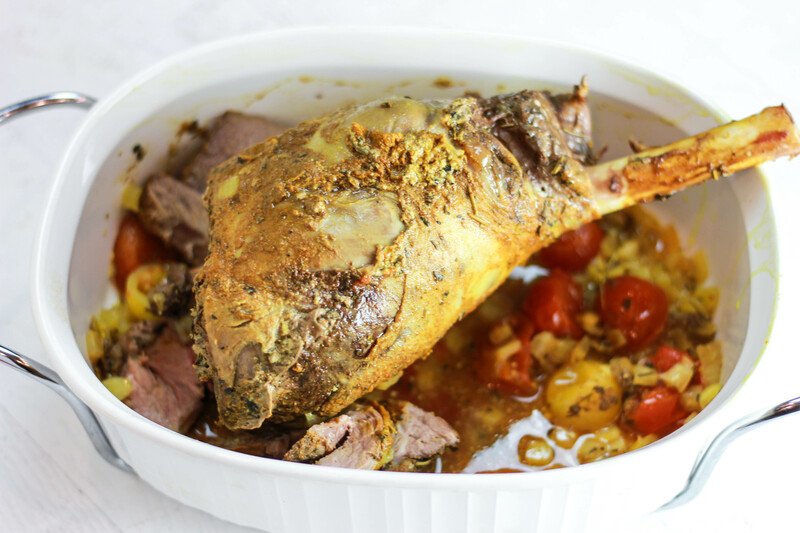 A lot of people are intimidated by cooking lamb in general, but you don’t need to overthink it. I promise – it’s not difficult! 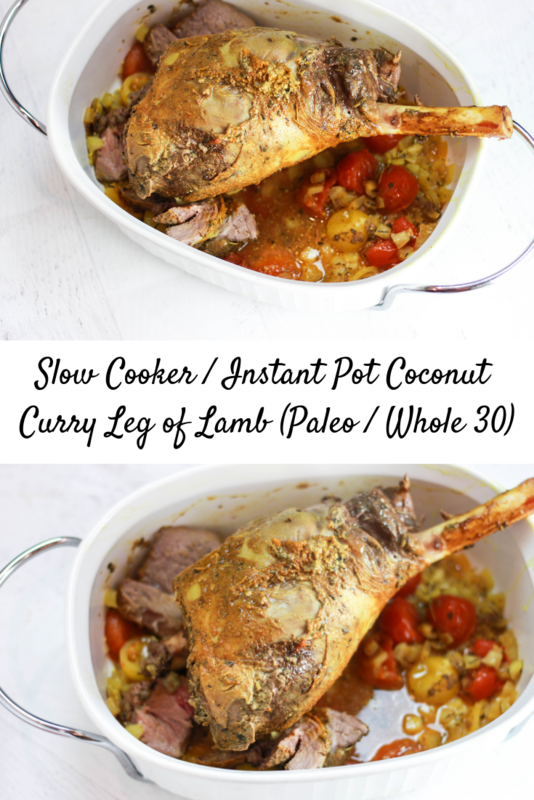 My favorite foolproof way to cook a leg of lamb is to use a slow cooker or an Instant Pot, which is exactly what I use in this recipe. Either will work, so use whatever you have. 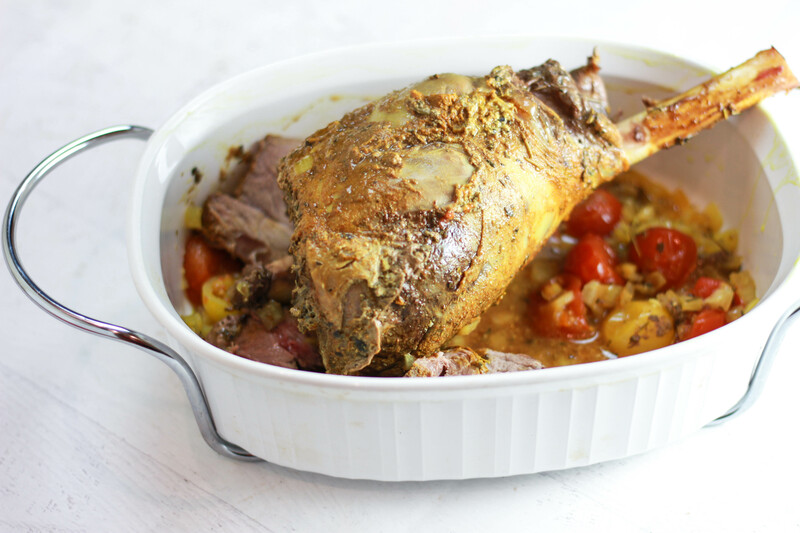 The key to making a delicious, melt-apart leg of lamb is to cook it slowly for a long time, and a slow cooker is the easiest way to do that. An Instant Pot is a pressure cooker that will create the same effect as a crockpot but over a much shorter period of time. The Instant Pot is definitely one of my favorite kitchen gadgets, but if I have the time, I like to use a slow cooker (or the slow cooker function on my Instant Pot). I love using a crockpot or Instant Pot because you can throw in all of your ingredients and completely forget about your food. After a few hours, all you have to do is open up the lid and your food is cooked, warm, and ready-to-eat! This is great if you’re short on time, want to save oven or stove space, or just want to make life a little bit easier. I like to leave lamb in the crockpot or Instant Pot for as long as I can, because I like my lamb to basically melt off the bone. If you like your meat a little less cooked, then take it out a bit earlier. 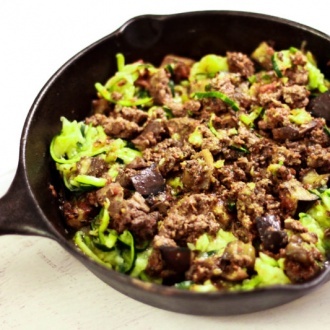 The way you get that melt-in-your-mouth flavor and texture is by cooking a fatty cut of meat for a looooong time. Patience is key. I also always recommend going with bone-in cuts! And don’t forget to eat the bone marrow after you’re done cooking. 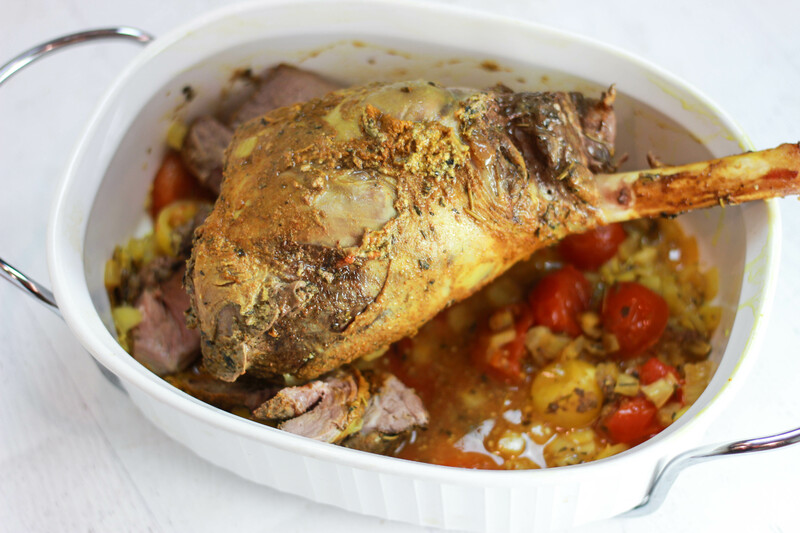 There are many different ways I like to flavor my lamb, but this recipe is one of my favorites when I’m cooking for a group because it combines all of my favorite spices in one dish! I like to use Italian seasonings like basil, thyme, rosemary, and oregano alongside curry seasoning and other warmer spices – you don’t usually get that mix in a restaurant! The coconut milk adds more to the thick and creamy flavor, and the tomatoes sweeten it up a bit. 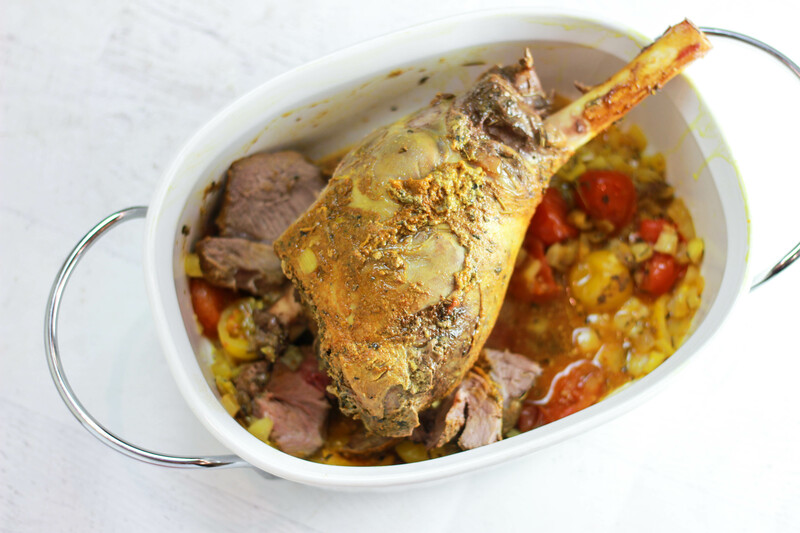 Sometimes I actually like the leftovers of this even more than when it’s served fresh, because the lamb has had extra time to soak in the mixture of coconut milk, onions, tomatoes, and spices. If you’re using a crockpot and checking in on the meat, you can also cut some off the bone as it cooks so more of it soaks fully in the bottom layer of liquid and spices – that will really enhance the flavor! Either way, after it’s done cooking, I suggest pulling all of the meat off the bone so that when you serve the lamb you can also scoop up the coconut milk / onion / tomato mixture at the bottom and eat it all together. 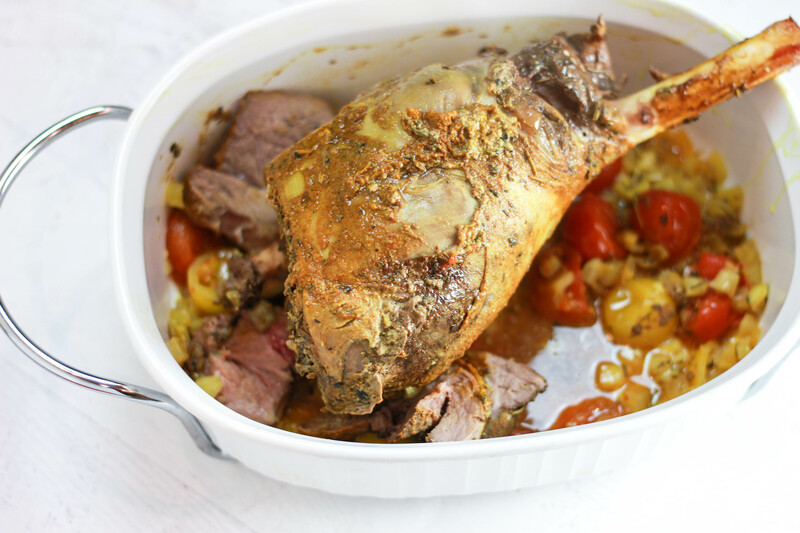 If you’ve been looking for a new way to make a leg of lamb, or if you’ve been intimidated to cook lamb, try out this recipe! You really just need to throw everything together in a slow cooker and you’re good to go. Easy as pie, but way easier. Plus, this main is a great way to impress a crowd, because they’ve probably never gotten this flavor combination from a restaurant! 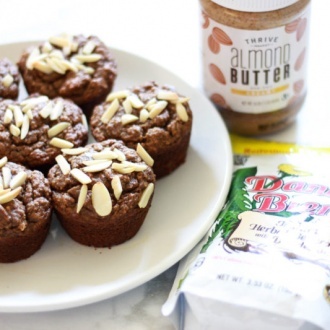 This recipe is paleo, Whole 30-friendly, low-carb, and keto-friendly. 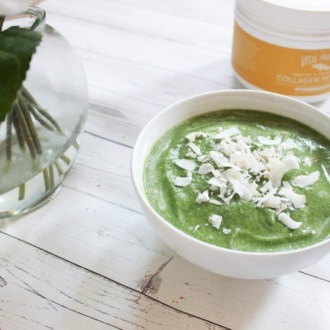 Serve it with any sides you like! Rinse the leg of lamb and pat it dry. Brush the leg with olive oil. Then rub the seasoning mixture all over the meat so that it’s fully coated. 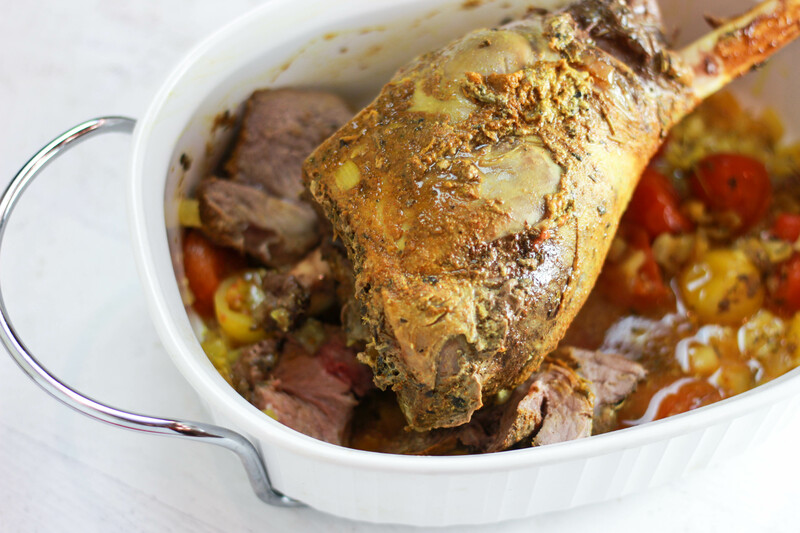 Place the leg of lamb in your slow cooker or Instant Pot. Try to lay it down completely if you can. Over top, pour in the coconut milk, chicken stock, onions, tomatoes, salt, and any leftover seasoning. If using a slow cooker, cook on low for 8-10 hours. (Leave it until it’s as cooked as you like it. The longer you cook it, the more it will melt off the bone.) If using an Instant Pot, cook on Manual for 60 minutes (make sure it’s set to “sealing”). After the time is up, remove the lid. 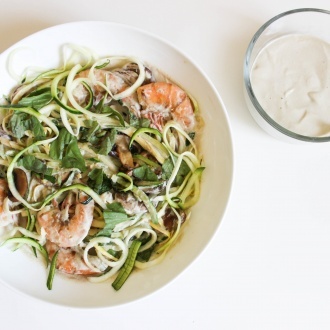 Pour everything into a serving dish, or serve straight from the slow cooker / Instant Pot. Enjoy!